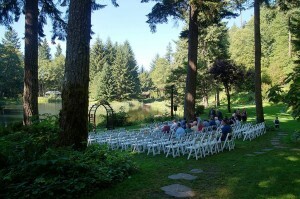 Home › Bridal Veil Lakes Wedding › Double Wedding at Bridal Veil Lakes! Double Wedding at Bridal Veil Lakes! Cristin and Adam came to Voila in the summer of 2012 to plan their 2013 wedding at Bridal Veil Lakes in the Columbia Gorge. 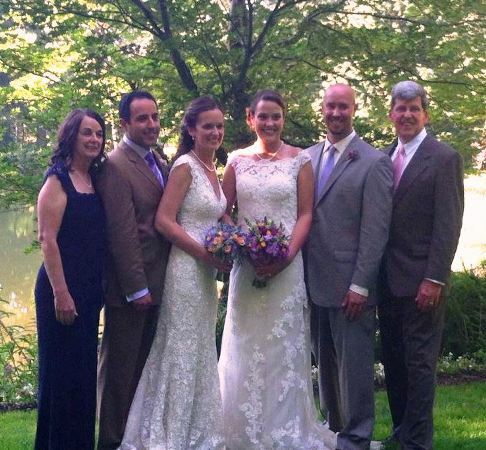 What a wonderful surprise when Cristin called later that winter to inquire about doing a double wedding! Cristin’s sister Megan had just gotten engaged to Orang. So instead of planning two weddings, we quickly revised the event plan for bringing three families together to celebrate a truly BIG DAY! 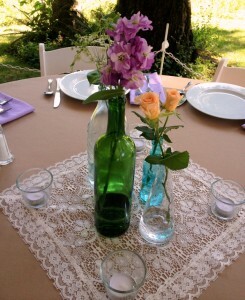 A double wedding is a challenging undertaking at Bridal Veil Lakes. So Voila helped plan the wedding and reception from guest arrival to guest departure and as well as determine appropriate food, beverages, staffing, and rentals. With all the planning from Voila Catering, the addition of an officiant, photographer, & DJ was all else that was needed for a unforgettable day for the brides, grooms, and guests! Our staff set the ceremony chairs were set for the 160+ guests across the Bridal Veil Lake from the reception area, this allowed the families time to greet their guests as they arrived. After the ceremony on the south side of Bridal Veil Lake, the guests walked around the west side of the lake to enjoy the beautiful views of the Columbia Gorge. To quickly serve the large number of guests walking from the ceremony, two bars were set up during the social hour before dinner. Uniformed servers greeted the guests from the ceremony with delicious, savory hors d’oeuvres to prepare them for the family style dinner soon to come. As the guests socialized, the two couples did a few photos around the Bridal Veil Lake before joining their guests for dinner. Elegant Pearl and Khaki Linens draped the tables with centerpieces and decorations set by the Voila team at Bridal Veil Lakes. Guests were seated to a plated Northwest Salad of local Blackberries, Candied Oregon Hazelnuts, and creamy Chevre cheese on Baby Greens with a slightly sweet Balsamic Vinaigrette Dressing. 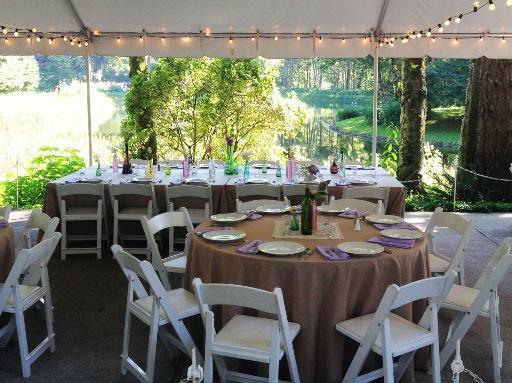 Bridal Veil Lakes is located over 45 minutes from downtown Portland in the Columbia River Gorge, so the only possible process of providing your guest with hot, fresh, quality food is to completely cook it on-site. 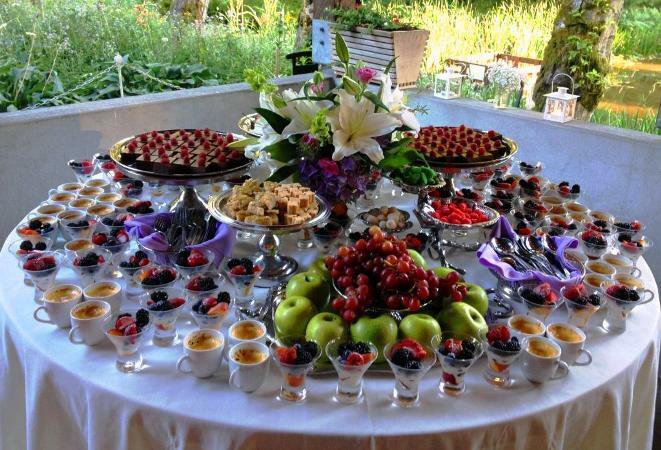 Voila Catering brings full size convection ovens, sautee sations, and a chef team to cook all the food at Bridal Veil Lakes…there are cheaper ways to serve food, but no other method meets our high standards. Executive Chef Tamara Kay of Voila Catering custom created the menu: Garlic marinated Chicken Breast with a from-scratch Sage-Madeira Reduction was served with Sautéed Brocolini with Hazelnut Butter, and Herb Roasted Peruvian Purple, Red, and Yukon Gold Potatoes….all served to the tables on large platters for their family-style dinner reception. The guests loved all the desserts…no need for a box for all the leftover wedding cake at this Bridal Veil Lakes reception!